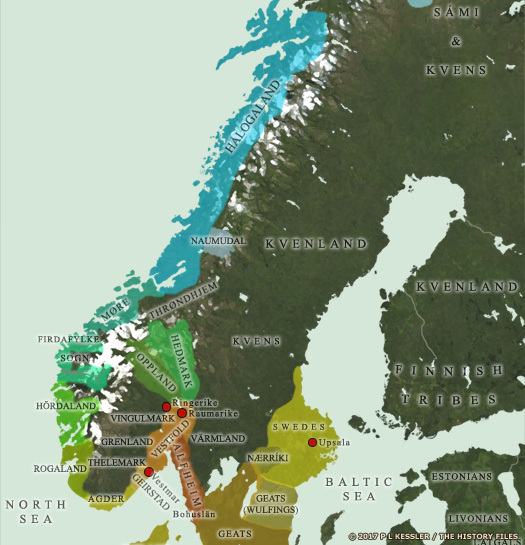 Between 865-874, groups of Vikings and Danes under Ivarr the Boneless and his brother, Halfdan, swept across England from the north and east, conquering Northumbria and East Anglia and large swathes of eastern Mercia. Not long afterwards, the acknowledged Danish leader in the south, Guthrum, assumed the title of king of East Anglia. The first king of Scandinavian York was Halfdan himself, ruling all of modern Yorkshire, Lancashire, and Cumbria. The kingdom was in effect an expanded continuation of the Anglian kingdom of Deira, and records for it are fairly poor, especially in comparison with those of Wessex for the period, so a certain amount of educated guesswork is required to established a full sequence of events. In 940, the kingdom gained (or regained) the 'Five Boroughs' of Derbyshire, Nottinghamshire, Lincoln, Leicestershire, and Stamford (the area around Spalding, always a separate region since it had been settled by the Spaldingas Angles in the fifth century, later Holland, and now South Holland, within Lincolnshire). King of the Viking kingdom of Dublin (873-883). Halfdan is expelled from York. There follows an apparent interregnum, but the fact that the next king, Guthfrith, does not claim the title until the year of Halfdan's death suggests that the kingdom's founder retains nominal rule of York, if only from Dublin. Even without a ruler in York itself, the Vikings there retain governorship of former Deira (southern Northumbria) and the vassalage of Bernicia (northern Northumbria, with a focus of power in Bamburgh). Once the Danelaw is established by the Peace of Wedmore in 878, Guthrum formalises his rule of East Anglia. A Danish kingdom is founded there to exist alongside the similarly-formed Scandinavian kingdom at York. Converted to Christianity. Ruled until 24 August. Guthfrith is the son of Hardacnut, sold into slavery as a boy and claimed by Abbot Eadred of Carlisle as the next king of York after a vision in which he is visited by Saint Cuthbert (founder of the monastery at Carlisle). Guthfrith's close relations with Carlisle force the vassal region of Bernicia to accept the direct control of York, although locals still rule in the king's name at Bamburgh. Formal recognition is made in the Treaty of Alfred and Guthrum of the Danish and Anglo-Saxon spheres of control (the Danelaw, which is controlled in the south from East Anglia, and Wessex, which incorporates half of Mercia, south and west of Watling Street). The treaty defines the boundaries of both kingdoms and makes provision for peaceful relations between the two peoples. Knutr is probably the Airdeconut whose name is engraved on some coins at this time. 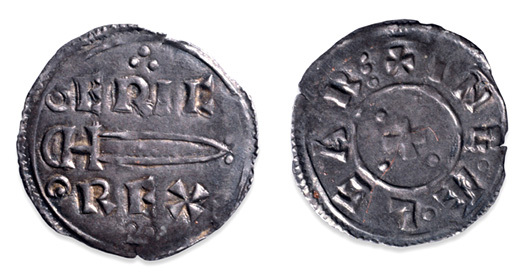 The latter name is thought to be the Anglo-Saxon coin maker's attempt to render the Danish name Harthacnut. The Airdeconut coin also reveals that within a generation of the Vikings starting to colonise permanent settlements in Britain, their kings had allied themselves to the Christian God. The reverse of the coin has the words DNS, Dominus Rex, arranged as a cross. Æthelwald, the son of Æthelred I, is driven from Wessex and takes refuge in York where the Danes receive him as king. Why they should do that when they have had a fairly successful line of Danish kings is unknown. Additionally, it seems convenient that two Danish kings should relinquish the throne at the same time, just as Æthelwald arrives. 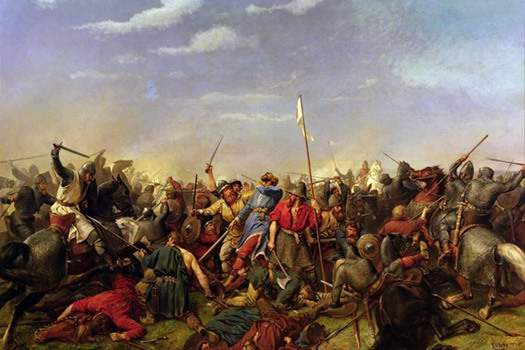 Are they insignificant enough to stand aside or be cast aside for a more powerful and important figure, and one with a claim to rule all Anglo-Saxons? It seems this may be the case as, once Æthelwald is killed in 903, they return to power. Around this time, perhaps during a short period in which the kingdom is weakened by the death of two kings in the same year, the Scandinavians appear to lose control of Cumbria in the north-west to the British kingdom of Strathclyde. However, they may retain some control of the area around the mouth of the River Mersey, or at least some settlements seem to survive there. Son of Æthelred I of Wessex. Killed in battle. During Æthelwald's reign, York gains full control of Ynys Manau from Dublin and rules it directly. 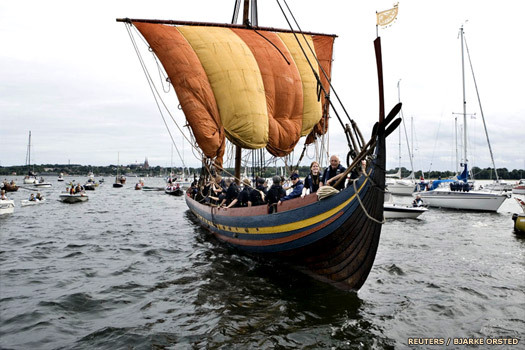 In this year, Æthelwald returns south, arriving on the Essex coast with Danish support, either from York or from Denmark itself. He ravages west as far as Mercia. Alternatively called 'prince', 'elected king', 'King of the Danes', and even 'King of the Pagans', in 903 (sometimes shown as 902) he is brought to battle against Edward of Wessex in a major confrontation somewhere in Cambridgeshire. Many fall on either side, including Eohric, king of the Danelaw and Æthelwald himself. However, Edward has to give the Danes silver to buy peace (and to buy time), while his own battered forces recover. Ruled for a second time. Ruled jointly with Siefred for a second time. Brothers and co-rulers - killed in Mercia. Æthelflaed of Mercia sends an army across the border with the Danelaw on a mission to recover the bones of St Oswald of Bernicia from their resting place at Bardney in Lindsey (probably under the control of York). St Oswald's bones are placed in Æthelflaed's recently founded New Minster Church of St Oswald, making it a shrine of great importance. A great army from the Danelaw (and possibly from York itself) plunges through the Mercian border, probably having been stirred up by the previous year's Mercian raid in Lindsey. It plunders and fights its way down as far as the Bristol Avon before turning north to follow the valley of the Severn. Heavy with plunder, the army is still crossing the River Tame (on its original course) when it is attacked by the Mercian and West Saxon army at Vuodnesfeld campo (Woden's Field, modern Wednesfield near Wolverhampton). The fighting ends at Tettenhall, which gives its name to the battle, and on the feast day of St Oswald, his bones so recently returned to Mercian possession. Halfdan II, Eowils, and Ingwer are all killed at the Battle of Tettenhall, along with their soothsayer and hundreds of their men. There is an apparent interregnum in the kingship at York, but it still seems likely that Scandinavians rule the city and its territory following the Saxon victory. However, the high reeve of Bamburgh has a strong claim to the throne and may even rule until his death in 913. His son Ealdred may succeed his possible rule of York. The borough of Derby is taken from York in 917 by the Lady of the Mercians, suggesting that there is still a Scandinavian or other independent ruler in control. In 918 the people of Leicester submit without battle, and York promises to accept Aethelflaed as overlord. Although she dies before this can be effected, her brother, Edward, king of Wessex, succeeds her and probably attempts to enforce the promise. At the same time (917 or 918), the Danish kingdom of East Anglia falls to Wessex, leaving York the only Norse-dominated centre in the country's mainland. The powerful Norse-Irish dynasty of Ivarr the Boneless seizes control of York from Dublin, potentially destroying the slow Anglo-Saxon recovery of the region. The high reeve of Bamburgh, Ealdred I, is driven back into his own lands, supporting the suggestion that a greater level of authority has been enjoyed by Bamburgh until this date. Ragnald accepts Edward, king of Wessex, as father and lord, beginning a period of close relations between the two kingdoms. York also allows local, client, kings to govern in Ynys Manau. He is succeeded there by Sihtric Caoch in 921. Sihtric goes on to marry, Edith, the sister of Æthelstan of Wessex and accept baptism. King of Dublin. Converted to Christianity & m Æthelstan's sister. Brother. King of Dublin. Defeated and expelled by Æthelstan. Son. King of Dublin. Expelled by Æthelstan. Upon the death of Sihtric, shortly after he renounces Christianity, Æthelstan of Wessex invades Northumbria and secures control of it with the support of the high reeves of Bamburgh, expelling the hopeful claimant, Olaf son of Guthfrith. The West Saxon king rules York as part of a united England until his death on 27 October 939. This is the very first time that a southern king rules unquestionably north of the Humber, and the event certainly also secures the re-conquest of Lindsey at the same time. With Æthelstan's death a fifteen year struggle for the future of an independent Northumbrian kingdom begins. Many Northumbrian leaders would rather be ruled by an integrated Danish nobility than the English south of the Humber. The Northumbrians conquer (or reconquer) the Five Boroughs region of the former Mercian Danelaw, comprising towns such as Derby, Leicester, Lincoln and Doncaster. The period around Olaf's death sees York lose control of Ynys Manau to Dublin, and the Five Boroughs are re-conquered by Edmund of Wessex. Olaf of Ireland. Ruled until summer 943. Son of Guthfrith. Co-ruler. Became king in 943. Killed? Olaf II previously had to give way to his more powerful uncle and his cousin, and wait for their demise - plus the death of Æthelstan - before he can sit on the throne. However, Olaf is not so effective as his cousin, and is soon usurped, and then defeated by Æthelstan's brother, Edmund, king of Wessex. He returns to Dublin. Restored. Defeated by Edmund of Wessex. The kingdom is ruled by Edmund of Wessex. Scandinavian adventurer Eric Bloodaxe is forced to flee Iceland following the death of his father and Haakon, his brother, being recalled to Norway to become king. Eric travels to Scotland with Arinbjørn Thorirson and then into England. The rulers of York have already officially submitted to King Eadred of Wessex in 946, but within a few months they have invited Eric to ascend the Northumbrian throne late in the year. In time Arinbjørn returns to Norway to take up or resume his post as jarl of Firdafylke. Former king of Norway (930-934). Eadred's burning of Ripon sees Eric Bloodaxe being rejected by the Northumbrian witan, despite him winning a battle against part of Eadred's army. Eric sails away to adventures overseas and Eadred of Wessex is acknowledged king of the Northumbrians. The subsequent reign of Anlaf Sihtricson, invited back by the Northumbrians in 949, can only be explained in terms of Eadred preferring him over Eric, as long as he (probably) submits to Eadred. Restored. Probably submitted to Eadred. A coalition of northern forces tributary to Eadred defeats Eric in battle, due in no small part to the allegiance of the high reeves of Bamburgh. Northumbria falls under the rule of the kings of England, to the dismay of the independent-minded Northumbrians. The new Earldom is administered by Oswulf, high reeve of Bamburgh. Oswulf, high reeve of Bamburgh, was handed the duties of governing the important and powerful region of York, once it had been conquered by the king of what was now a fully united kingdom of England. The high reeves had played an important part in the final English conquest of York, supporting the Wessex-based Saxon kings from 927, but they had also held their own claim to the throne of York since the fall of the kings of Northumbria. They may well have ruled in York between 910-918, although this is very hard to establish with the available evidence. High reeve of Bamburgh (930-963). High reeve of Bamburgh (963-995). With the help of Uchtred, high reeve of Bamburgh, Edmund Ironsides fights strongly to prevent the Danish control of England. After a series of successes, one disastrous defeat achieved through the treachery of his Mercian ally, Earl Eadric Streona, is enough to end his resistance. Canute becomes king in 1016 and Eadric Streona is dispatched by Eric of Hlathir. The title briefly lapses while England is ruled by Canute. Earl of all Northumbria from 1041. Eadulf of Bamburgh launches an attack on Scots territory by raiding into Cumbria in 1038. In a revenge attack, Duncan lays siege to Durham in the following year, only to be put to flight. His cavalry is savaged during the fighting and the heads of his slain foot soldiers are collected in the marketplace to be hung upon posts. Eadulf's actions soon bring retribution down upon his head from Siward as Duncan's relative by marriage and Eadulf's main opposition in the north of England. Siward governs Bernicia without any local officials under him, fully uniting north and south Northumbria under one 'ruler' and ending the line of high reeves of Bamburgh, his main source of competition. Instead, Siward is dominant as earl of Northumbria (this title effectively replaces that of king of York). A year after Harold's rebellious younger brother, Earl Tostig of Northumbria, flees the country, Harold's army defeats an attempted invasion of England by the Norwegian king, Harald Hadrada, who has sided with Tostig. Almost immediately afterwards, Harold has to march his tired army south to face a second invasion by William, duke of Normandy. Harold is narrowly defeated at Hastings on 14 October, and the Anglo-Saxon line of kings comes to an end. Northumbria (York and Bamburgh) is broken up into the earldoms of Northumberland and York. Unfortunately, there seem to be no records concerning any earls of York until 1138. William le Gros is created earl of York by the Norman king of England, Stephen. The title becomes extinct again upon William's death in 1179. The title is briefly resurrected for Otto by the Plantagenet king, Richard I, but again becomes extinct by 1218 at the latest, which is when Otto dies. It is also possible that he hands the title back when he becomes count of Poitou, especially because the linked attempt to make him king of Scotland has already failed. Otto IV of Brunswick. Duke of Swabia. HRE (1198-1212). The title 'Duke of York' is created for Edmund of Langley, the fourth surviving son of Plantagenet king Edward III. From him it passes to his son, Edward of Norwich, as the second duke, and to Richard Plantagenet (Edwards nephew) as third duke. The fourth duke becomes Edward VI of the House of York. Although there are frequent subsequent breaks, it becomes traditional for the English monarch to hand this title to his second son, and this practice continues in use to the present day.